e-mail address Password Forgot password? Mexico City, Mexico – May 5, 2014 – Mobility and the state of its application eco-system are hot-topics in today’s world of computing, so when the sumptuous Casino Español hosted the unveiling of Four Js’ ‘best kept secret‘ – Genero Mobile – on April 11th, there was naturally a great deal of interest from the local developer community. Event organisers were overwhelmed by demand – 350 people confirmed their presence on the eve of the show for an already high-capacity venue fit for 200 people. A second event is being planned to cater for those unable to attend. Genero Mobile is the first developer framework to let developers ‘kill two birds with one stone’ combining cross-platform and native operating system benefits for both iOS and Android platforms, all from a single code base. Rivals typically rely on HTML5 for cross-platform development at the expense of a native user experience or alternatively force developers to learn hundreds of proprietary system calls at the expense of cross-platform compatibility. After an opening speech laying out Four J’s vision for the application development market, a live demontsration showed how easy it is to create business applications at the same time for the world’s leading mobile platforms. A spontaneous question and answer session from developers sparked further interest for 40 minutes as they began to realise Genero Mobile’s potential. Those accustomed to developing twice for both iOS and Android struggled at first to believe that it was possible to develop native applications for both systems at the same time. The morning ended with a gripping account of Tramontina‘s Genero experience and how its longstanding relationship with Four Js has saved them $50M USD by averting an SAP implementation with a bespoke in-house development and 17 staff. 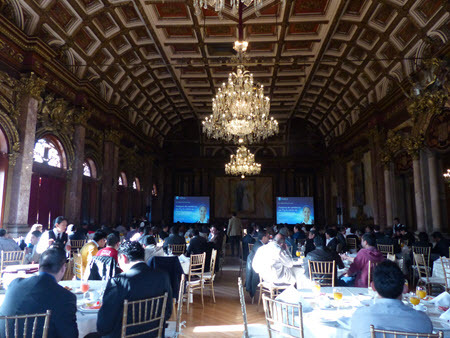 A broad cross-section of Mexican industry attended including CIOs from Pemex, ISSSTE, CFE – Instituto de Investigaciones Eléctricas, BANAMEX, GRUPO SALINAS, ISSEMYM, SAGARPA, BANXICO, GALENO and Secretaría de Educación Pública (SEP). The event provided a good opportunity to meet new faces – over 60% of the delegates were unfamiliar with Four Js. Four Js Development Tools Inc.
Four Js Development Tools, Inc.
© 1995-2019, Four Js Development Tools Europe Ltd.